HANOVER, N.H. – Outbreaks of the southern pine beetle can’t be stopped by its main predator, but risks to forests from this tree-killing insect can be predicted with a simple, inexpensive monitoring program, according to a study by Dartmouth College and other institutions. The findings appear in the journal Ecography. A PDF is available on request. The study included researchers from Dartmouth, the U.S. Forest Service and Texas A&M University. The southern pine beetle has coexisted with North American pines for millions of years, but recent warming of winter temperatures has allowed the beetle’s range to extend as far north as New York and Massachusetts. The researchers used data from a forest monitoring program to evaluate how forest risk varies from location to location and to evaluate whether the southern pine beetle’s natural predator, the checkered beetle, can stop outbreaks. Their results show that southern pine beetle outbreaks rise and fall remarkably synchronously across hundreds of miles. This means that the risks in any year and any region can be predicted with a simple, inexpensive monitoring program that measures their abundance by using traps baited with the pheromones that the southern pine beetles use themselves to find each other. The results also provide further evidence that weather, such as the coldest night of the winter, influences pest abundance and affects epidemics. Pine beetle outbreaks have historically affected virtually all aspects of southern pine ecosystems and caused incalculable costs to local communities, state economies and the enormous forest products industry based on southern pines. Now, the pest is killing pine trees much farther north, raising major challenges to natural resource management and the maintenance of ecosystem services. 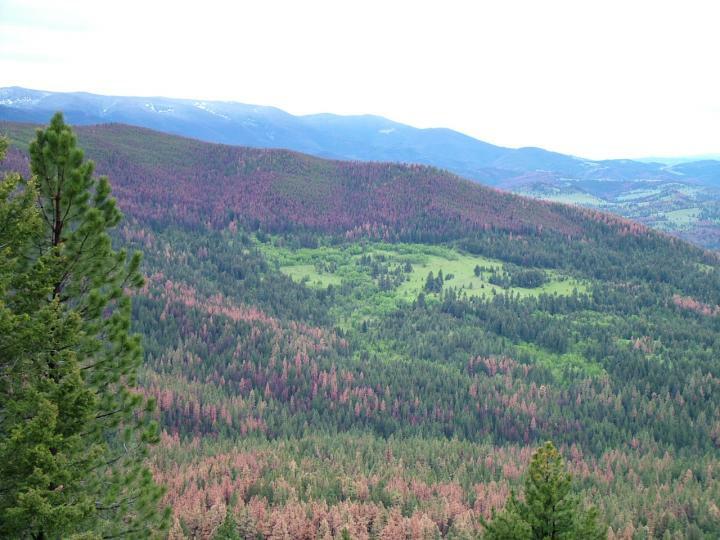 Fortunately, entomologists and forest managers have developed techniques that do not require insecticides and can greatly reduce impacts from southern pine beetles. These include removing individual trees that are crowded with beetles and thinning overstocked forests before they are infested. “One challenge is that climate change has allowed the pest to expand its range into more northerly regions, where landowners and forest managers do not have experience with these techniques nor the resources to implement them,” Ayres says. Credit: Dartmouth College via Eurekalert!